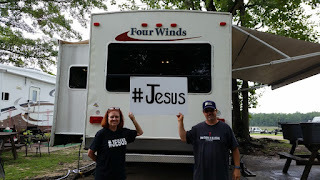 We sold most of our possessions from our 4 BR home and squeezed into this 29 foot trailer named the FOUR WINDS. There is an urgent call for the Mississippi Gulf Coast lukewarm to get on fire for Jesus. REVIVAL FIRE. The church has died from what it once was in the book of ACTS. These dry bones can live again and be an exceeding great army. Do you hear the sound of the trumpet? It is time for #TeamJesus to rise up. This could be the LAST CALL! The Name of this trailer was a solid prophetic confirmation. Ezekiel 37:9-10 Then said he unto me, Prophesy unto the wind, prophesy, son of man, and say to the wind, Thus saith the Lord GOD; Come from the FOUR WINDS, O breath, and breathe upon these slain, that they may live. (10) So I prophesied as he commanded me, and the breath came into them, and they lived, and stood up upon their feet, an exceeding great army.